LUCY BURDETTE: We writers have some really special moments and one of them is getting nominated for an award. (Right now, Hallie's book COME AND FIND ME is nominated for the Mary HIggins Clark award, and Rhy's NAUGHTY IN NICE is nominated for a Malice Domestic's Agatha award for best historical novel, and my story "The Itinerary" is nominated for an Agatha for best short story.) One of our good New England friends has a book nominated for an Edgar best first novel--as you've heard in other blog posts, we'd all kill for to land an Edgar. Instead of wallowing in envy, we're so thrilled for Steve. And as he's going to tell us, there's nothing better than the days and weeks before the winner is announced. We had a lot in common. Like me, the guy was from Massachusetts. Like me, he'd recently seen his debut novel published. And like me, he was - I remember this great line - "waiting for the parade to come by my house." Unspoken follow-up: It would be unwise to hold your breath waiting for that particular parade. The guy turned out to be Leonard Rosen. His debut was the brilliant All Cry Chaos. And half a year after that Bouchercon meeting, the two of us are up for the Best First Novel Edgar. Funny thing, publishing your debut. It's the biggest moment of your life. People tell you you're pretty great. You are queen or king for precisely 24 hours (release day) plus the duration of your launch party. The wheel keeps rolling. The machine grinds on. The next batch of writers, debut and otherwise, get their turn. Their reviews are (at least) as good as yours, their blurbs (at least) as impressive. So you take one last glance out front just in case there is a parade going past (there isn't), then do what writers do: plop yourself in the chair and work on another book. A better book. from folks you very much admire that your book is good, that it does stand out. And boy, do this year's Best First nominees - my competition, I guess, though I (naively?) don't view them that way - stand out. I read them all, starting with All Cry Chaos, and damn are they fine books. Edward Conlon's Red on Red, David Duffy's Last to Fold, and Lori Roy's Bent Road are utterly different from one another. And they're all ridiculously strong. I'm honored that Purgatory Chasm is among them. Here's the part where you roll your eyes while I insist I truly mean it: I feel like I've won by being nominated. This week's Edgar Awards in New York will be a blast, icing on somebody's cake, but it's the nomination that made my year. Knock it off with the eyes. I mean it! Truly! After all, I got a nice bump in sales. I've received congrats from writers I admire. I'll benefit from the Edgar Finalist Author tag for the duration of my career. Which, when you think about it, means I got a parade after all. Steve Ulfelder is an amateur race driver and co-owner of Flatout Motorsports Inc., a company that builds race cars. 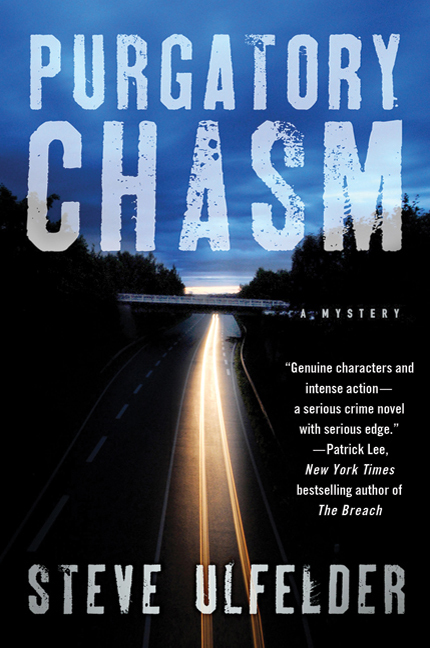 In addition to being nominated for MWA's Best First Novel Edgar, his debut, Purgatory Chasm, has been named Best First Mystery of 2011 by RT Book Reviews. His second novel, The Whole Lie, comes out May 8. Our own Hank Phillippi Ryan will be moderating a panel of the Edgar best first nominees this Wednesday--including Steve! A great post! ENJOY YOUR PARADE!!! and congrats on the Edgar nomination. I do think that it really is an honor to be nominated. Though taking home the prize would be the best. Fingers crossed for us all! I was lucky enough to score ARCs of both Purgatory Chasm and The Whole Lie. The first page alone of Purgatory Chasm made me a fan for life. Jan, does it count as a parade if it's just me wandering aimlessly down 5th Ave.? Hallie, see you there - fingers crossed indeed! Joyce, you are so kind - your support has always meant so much to me. Thanks! Nice post, Steve. Wishing a nice drum cadence and big bash of cymbals for you and Conway Sax, too. 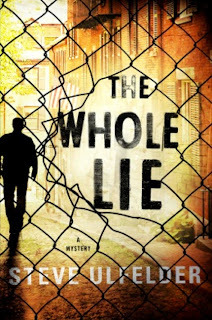 Edgar nominee for Best First Novel Steve Ulfelder's PURGATORY CHASM and the sequel THE WHOLE LIE, to Stephen Feldberg at Audible, in a nice deal, for publication in 2012, by Jacqueline Murphy at FinePrint Literary Management. I've got a one-woman parade going for Steve out here in California. And, as I've already told him, I'm crossing fingers all week. I love that I found him (though we've never met in person) because of our racing connection, which just goes to show that in this community, we'll get behind each other over any connection (or none) at all. We meet some really wonderful people that way. Good luck, Steve! Hey, I'm here thinking of tough questions! So, Reds, what should I ask Steve at the Symposium panel tomorrow? And the other first-novel nominees? Steve, what do YOU think I should ask? And let me say, I think if you come CLOSE to the captcha words, that should be good enough to prove you're not a robot. Plus, wouldn't a robot get them RIGHT? So the way to prove you're human is to get them wrong. I'm just saying. Congratulations, Steve! I hope you win yours and Hallie wins hers and Rhys wins hers! I'll be there at Malice to see Rhys pick up her teapot. I'll be spotty in attendance from here on out for a while. Off to launch EVERY LAST SECRET and then to Malice Domestic. Love to all the Reds and Reds backbloggers! Love this, Steve -- thanks for the parade line. (Well, thanks for quoting Len about the parade.) With my book nominated for an Agatha -- and isn't THAT weird, nonfiction and all -- I'm having my own little parade out here in the Montana woods. The cat and I are waving and cheering for you, and all the nominated Reds! See quite a few of you later this week at Malice! Hurray for you too Leslie! Hope you are enjoying this little nomination bubble--and our fingers and toes are crossed for your book! Marching for Leslie, too!! xoxo Whoa. Good thing I was in the high school band.. Ask him about car racing,Hank. That whole culture. And how someone presumeably into SPEED could slow down enough to write that terrific novel? Steve, this is a parade. It lasts longer than any other parade. Then you'll go back to your infernal, internal parade. Go all you Reds nominees! Ulfelder, you've definitely found your calling as a fiction writer, because by the time I finished this post I thought, "Gee, he really DOES sound like he's honored just to be nominated." And we all know that's a lie. P.S. I hope you win. Thanks, all, for the kind words. And thank YOU, Brad, for the ... words. Hank, I've seen you grill those poor slumlords on TV. No way am I feeding you tough questions. Oh, no, Steve, I'm really really really nice. :-) Nicer than Brad, anyway. (Oh, and Ulfelder: Your post was really quite charming, but I'll never admit I said it). Meet Mary, Or is it Claudia? Invent your own Friday the 13th! Everything From "A" Clear Down Through "Z"!